I'm doing pretty good with my quest to get rid of much of what I own. I actually found an apartment with a separate bedroom that's in my price range, which means I won't have to roll out of bed - into the kitchen... which would have just been tragic in so many ways. Last night I took some CDs to CD Warehouse and got $38.00!! I'll definitely be going back with more CDs and DVDs - who needs this stuff? The books, oh, the books. Well, I cleaned them out. I downsized. I don't need to keep all of them. So, I'll take the ones I'm willing to part with to Half Price Books - probably over the weekend. I think I may have sold my elliptical trainer to one of my co-workers. So, I'm making progress, and that's good. Much of the work will have to wait until the weekend, however. I just can't be in the garage organizing the garage sale stuff during the week, because the dust gets all stirred up and it makes me sneeze hundreds of times. And well, that's just not practical. For example, a couple of hours ago, I accidentally took a couple of "nighttime" Tylenol Allergy & Sinus pills. Now, I'm just praying that my coffee can penetrate the fog in about an hour. Ugh. P.S. My neighbors are all apparently amateur fireworks setter-offers. Poor Brokaw. 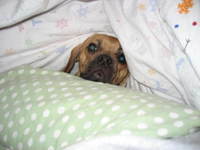 He keeps burrowing under the covers... then he runs a couple of laps around the house, then it's back under the covers. Poor puggle. Stop the insanity, people!! 20 minutes with "Mr. Puggles"